Hosei University Research Center for International Japanese Studies | HIJAS’ Research Meeting “Priests of Esoteric Buddhism in the Middle Age and Their Discussion on the Origin of Japan’s Country Name and Manner of Worshipping” Will Be Held on 26th July 2018. Hosei University Research Center for International Japanese Studies HOME > News > Fiscal Year 2018 > HIJAS’ Research Meeting “Priests of Esoteric Buddhism in the Middle Age and Their Discussion on the Origin of Japan’s Country Name and Manner of Worshipping” Will Be Held on 26th July 2018. HIJAS’ Research Meeting “Priests of Esoteric Buddhism in the Middle Age and Their Discussion on the Origin of Japan’s Country Name and Manner of Worshipping” Will Be Held on 26th July 2018. 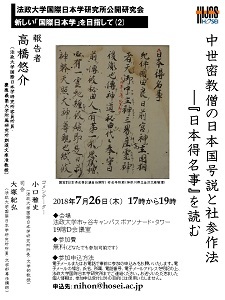 HIJAS’ Research Meeting “Priests of Esoteric Buddhism in the Middle Age and Their Discussion on the Origin of Japan’s Country Name and Manner of Worshipping” will be held at Hosei University Thursday, on 26th July 2018. Speaker is Associate Professor Dr. Yusuke Takahashi of Keio University, Chair is Lecturer Dr. Norihiro Otsuka, and Commentator is Director Professor Masashi Oguchi.